Very fitting in black and white. I like the mood of the shot. The sun was almost set, the light from the west coming in horizontally. 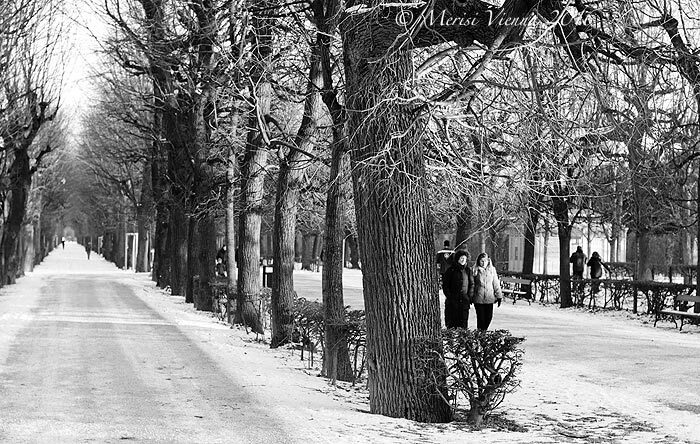 Merisi, black and white photography really do let winter snow and trees look their best. Perhaps by tomorrow morning, we will have such visual temptations apparent here in New York. Wow beautiful. Great monochrome click. Beautifully composed. A really fine shot. Weather looks comfortable for a promenade. Love it! Enjoy the snow. Nice shot! I like how the two couples mirror each other. For sure an amazing place to have a winter walk! Greetings!